PEI beef is raised on family farms and is characterized by its unique marbling, texture and colour, producing an exquisite flavour and sensation. Health Fact } PEI beef is a great source of protein, zinc, “heme” iron and B-complex vitamins. Heat a grill to medium-high heat; season beef with salt & pepper. Grill beef for 5 minutes, flip over and continue cooking for an additional 5 minutes until beef is medium rare. Remove beef from grill and place onto a cutting board, cover with foil and rest for 5-10 minutes. Thinly slice beef. Combine sliced vegetables in a bowl and stir in 2-3 tbsp of your favourite dressing. 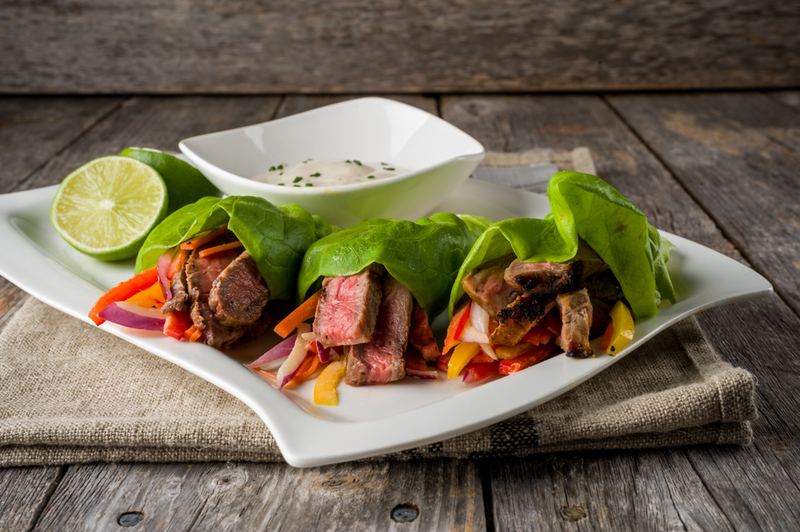 Place Boston Bibb lettuce onto plates; top with vegetable slaw and beef striploin. Fold lettuce wraps as desired and serve with remaining dressing.